Juergen Woehler, secretary general of the Korean-German Chamber of Commerce and Industry, was awarded the Cross of the Order of Merit of the Federal Republic of Germany ("Bundesverdienstkreuz amBande") by German President Horst Koehler for promoting German-Korean relations. 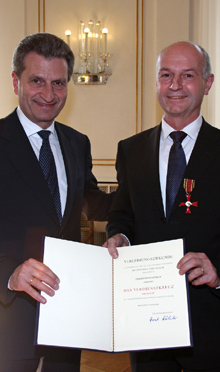 At the solemn ceremony in Stuttgart on April 24, the Minister President of Baden-Wuerttemberg, Guenther Oettinger, handed over the Order of Merit to Juergen Woehler and referring to his decade-long professional and honorary commitment for the German-Korean relations, especially within the economic sector. Juergen Woehler worked for the chamber in Seoul from1985 - 1987, when he also met his wife, Mi-Kyoung. Hekept involved with Korea as a Board Member and Chairman of the German-Korean Business Association, Korea Country Committee Chairman of the German Asia-Pacific Business Association and Board Member of the German-Korean Society. He gave Germanbusinessmen and in particular young people an understanding of Korea through publications, interviews as well as lectures. Today, the KGCCI has more than400 member companies representing all types of businesses.The KGCCI is an experienced and proven partner for Korean and German companies. KGCCI offers professional, comprehen-sive and costumer-focused services. Furthermore, KGCCI is the official representative of the Korean-German business world, e.g. at official bilateral consultations. For details or inquiries please contact Carsten Lienemann, Deputy Secretary General of Korean-German Chamber of Commerce and Industry - KGCCI.